So here’s what I wonder. What if Jesus had said, “Ok. Yes, I’ll do it?” What if he had turned just one small stone into a small loaf of bread? He’s hungry, famished. Why not fill the emptiness? Not a feast or even a big loaf. No butter. Just a little something to get him by. What if he had accepted the glory and authority of all the kingdoms of the world? They are rightfully his anyway. Don’t the ends justify the means? Why not free fall into the arms of the angels? After all he is the beloved son. What if Jesus had said, “Ok. Yes, I’ll do it?” Would Jesus have been less beloved? Would he have no longer been God’s Son? Would Jesus have been a failure? Those sound like questions of idle curiosity, speculations, but they’re not. Jesus may not have said, “Ok. Yes, I’ll do it,” but I have. Maybe you have as well. Sometimes we hunger for attention, acceptance, approval. Each of us, I suspect, has known the hole and emptiness of restlessness, boredom, and that sense that we are going nowhere and life has no meaning. 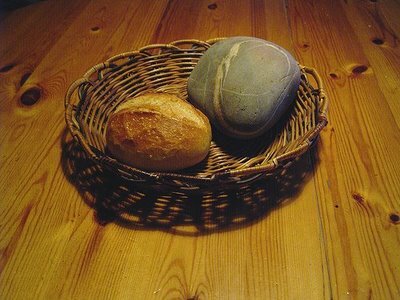 No, we haven’t turned a stone into a piece of bread but we’ve likely filled our emptiness and fed our hunger with something less than nutritious and life-giving, something other than what we know God would want for us. We only wanted a little something to get us by, fill the hole, and satisfy the hunger. But it doesn’t. It never does. It only gets us to the next fix. Other times we know better but we don’t do better. We take the easy way out. We do less than we really want to do. We take a shortcut through life. It’s easy to justify. Everyone does it. No one got hurt. I deserve it. The ends justify the means. No one knew. Jesus’ temptations in the wilderness are not all that different than our temptations. The wilderness is not so much a place as a situation. Like Jesus we are sometimes left alone with our thoughts. Who am I? What is my life about? How will I get through this? In the wilderness there will always be a voice that is quick to offer an answer, an idea, a way. Jesus was tempted in every way as are we. The difference is that Jesus said, “No,” and sometimes we’ve said, “Ok. Yes, I’ll do it.” In that moment are we less beloved of God? Are we somehow less God’s son or daughter? Are we a failure? Turn the questions around. If we had said, “No,” would we be more beloved? More God’s child? Would we have passed and be a spiritual success? That duality between good and bad, right and wrong, passing and failing, often underlies our understanding of temptation. Temptations are seen as God’s pop quiz. The test has been distributed. God waits for the results and we wait for a grade. This idea of scorekeeping by God and us is, I think, what sometimes gives Lent a bad reputation and it is what tends to keep us stuck. Today’s gospel offers the way forward. Every year on the First Sunday of Lent we hear the story of Jesus’ temptations (Mt. 4:1-11; Mk. 2:12-13; Lk. 4:1-13). The dust of Ash Wednesday has become the sand of the desert, the wilderness, the place of temptation. We are brought face to face with the temptations of our life. So how are we to understand them? Let’s start with Jesus. He is baptized and immediately goes to the wilderness where he is tempted. At his baptism the Spirit descended upon him and the heavenly voice declared, “You are my Son, the Beloved; with you I am well pleased. That’s the reality even before the temptation, before the results are in. That’s the reality for us as well. The relationship has already been established. Grace always precedes temptation. Whether Jesus said yes or no did not determine his sonship, his belovedness, or how pleased God was. The temptations, the struggles in the desert, did not determine how God would know Jesus but how Jesus would know himself. In struggling with his temptations Jesus began to know himself to be filled with and led by the Spirit. The voice that spoke from without at his baptism was interiorized and spoke from the depths of his being. The temptations were not a pass-fail exam but information that let Jesus understand himself. That’s what they are for us as well. Every temptation is the opportunity to rediscover, affirm, and claim our identity as a beloved child of God, one in whom he is well pleased. The temptations did not establish Jesus’ sonship, they helped reveal and confirm it. The temptations did not overcome his sonship. His sonship is what overcame the temptations. It’s the same for us. If that is Jesus’ way then it is also our way. Our responses to the temptations of life, whether “yes” or “no,” tell us something about ourselves. They offer information about who and whose we believe ourselves to be. They reveal where we place our trust, how we see the world, and our way of being towards others. In facing our temptations we discover our true hunger and emptiness. We find out where it hurts and see how we act out of our wounds. We discover our weaknesses. We can become awakened and self-aware. With each temptation we learn a little more about ourselves. That is important information. It is diagnostic. All of this offers an opportunity for a new life and a new way of being as beloved children of God. Treatment and healing can only ever happen after the diagnosis has been made. There is no salvation without temptation. You could say we are tempted into salvation. This sermon, for the First Sunday in Lent, Year C, is based on Luke 4:1-13. “With each temptation we learn a little more about ourselves. That is important information. It is diagnostic.” – I never thought of it like that – more helpful than a “test”. Thank you again for your blog. Elizabeth, I hope the post was helpful and appreciate you reading my blog. To me diagnosis implies hope, change, and movement but a test is static and judging. The underlying question is whether we understand God to be on our side, against us, or neutral. I agree. It does imply hope and allows for change. Often it is used for condemnation. I do try to always, in faith, to live as though God is on my side. I don’t often comment on your posts but do appreciate your writing and your thoughtful reflections and snippets of ancient wisdom. Thank you, Elizabeth, for your kind and encouraging words. Very true. Sins are the gauge of where we stand spiritually, internally. If I hide myself from all kind of temptation, it does not make me better; it does not mean I am stronger. I just will not know my weaknesses, or my shadows. That is an outstanding post! Very thought provoking and just incredibly well written. Thankyou! Thank you Stephanie. I do appreciate your kind and encouraging comment. Thank you for the reflection, if I could only pause long enough, after such tempting suggestions, to say “No” to the temptation. Alas I often realize after the fact that I had been deceived. Jane, I think that is the experience for many of us. The after the fact realization, however, is still an important learning. It offers information that can help with the next temptation. It shows us where we might be vulnerable, a place in which to be watchful and cautious. His temptations were not about whether he would change the stone into bread. It was about his identity. His no was not about changing the stones; it was about the fact that he did not need to do it to prove that he is the Son of God. Thanks, Karm, for your comment. I agree the temptations are related to Jesus’ identity. Jesus’ identity as the Son of God is not a matter of proof but faith. Illuminating, practical interpretation of the Temptation of Christ. In the twilight of my nursing career, it is tempting to just ride along, to get by…but this does my spirit, my intellect, my sense of ethics, and my patients less good; better to use this approach and say, I am worthy to learn XYZ…to apply this or that….to continue to grow even as I wind down my practice over the next few years. Drat – was so “easy” the other way :). Thank you. Roberta, I do understand. I wonder what surprises and gifts might be in store for you and your patients. We are lovingly persuaded or righteously enticed into salvation. Lead us not into temptation. The Lord does not lead us into temptation. He leads us to himself. Thanks for this article. God bless you. Laura, your word “enticed into salvation” is such truth! It is like Jeremiah saying to God, “you have seduced me Lord, and I have let myself be seduced . . .” and I ask myself, “what is it that I seek, that is whom is it that I seek, that so mysterious ONE who loves me first, and hopes for my love in return?